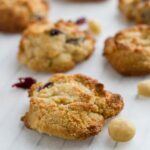 Cranberry + Macadamia Cookies!!! YUM!! These cookies are absolutely delicious and so easy to make! They take 5 minutes to prepare and 10 minutes to bake. How good is that !?! They are gluten, dairy and refined sugar free as well as being suitable for paleo and vegan lifestyles. The recipe makes 10 cookies, but you can easily double or triple the batch to make more. If you are after more cookie recipes, then make sure you check out my chocolate chip cookies and lemon and cashew cookies. Add almond meal and baking powder to a bowl, mixing to combine. Add coconut oil, maple syrup and vanilla extract to another bowl, stirring to combine. Add the wet mixture to dry mixture, stirring well to combine. Add macadamias and cranberries and fold through the mixture. Using 1/8 cup measurement or soup spoons, scoop mixture on lined baking tray and flatten with hand or back of spoon. Place in the oven for 8-10 minutes or until the edges start to brown. Transfer to a cooling rack and allow to cool completely. The cooking time does not include the time is takes for these cookies to cool down.